The education of respect for the common property will include respect for the things that in the school are common properties and for social properties, such as: parks, libraries, theatres, monuments, museums, cinemas, etc. The child has to be taught from a very early age at school not to break plants in the garden, not to mistreat furniture, not to paint on the walls, to take care of the books in the library, the corners, water fountains, decorations, sculptures, paintings, etc. In the community and in the cities there are properties that all the population use and enjoy and it is necessary to teach the little ones not to soil them by throwing papers and leftovers in the streets, parks, fountains, theatres, cinemas. Also, not to mistreat the animals and plants of parks and zoos, nor to break seats of places of common use like the cinemas, libraries, video rooms, theatres, etc. To take care of the artistic and cultural patrimony of the city where we live (buildings, archives and libraries, paintings and decorations). The teacher, parents and adults in general will have to be the best example that the child has in this learning. Summary of the activity: The children will watch videotapes, photos or pictures, with some of the cultural properties of the country and the community where they live (Museums, theatres, parks, etc), later we will talk with them about how to take care of them and to respect them because they are everybody’s heritage. Finally we will make constructions, models and drawings of some of the cultural properties of the city. • To develop in the children knowledge on the city’s cultural patrimony. • To stimulate in the children feelings of respect and care towards the common properties of their country, city or community. Material Resources: Videotapes, CD, pictures, cards with views of the city’s cultural patrimony, coloured pencils, watercolours, paper, clay or plasticine to model, building blocks. This part consists of contemplating images of things that comprise the cultural patrimony of the country or the city and the community where the school is, so that later we can talk about what we saw and teach the children how we must take care of them and respect them and why. These cultural properties will be shown using pictures, photos, digital support or videotapes. We will explain to the children that the churches, parks, streets, fountains, museums and monuments are cultural properties of common use, which have to be taken care of and be respected. All of them form the cultural patrimony of our great city. From all parts of the world millions of people come to our city to visit its cultural patrimony every year, this is why we must take care of them. How do you think we should take care of and respect our cultural patrimony? Why do we say that they are common properties? They are common properties because they are for the benefit of all those who visit them, either from our country or from other countries that come to know them, to contemplate their beauty and to learn new things. In this session the children will make drawings, models and constructions of some of the common properties that they have seen in the activity. They recognized our cultural patrimony and why it is necessary to respect it and to take care of it. They needed help to know our cultural patrimony and why it is necessary to respect it and to take care of it. They made pretty constructions, models and drawings of some cultural properties. They needed help to make pretty constructions, models and drawings of some cultural properties. They showed feelings of care and respect towards the common properties of their city, country or community. They were able to assimilate the notion of common property. "RESPECT FOR THE COMMON PROPERTY"
Summary of the activity: There will be a conversation with "Solomon" the puppet to show through pictures what a common property is and why we have to take care of and respect it. It will end with a motion game. • To help the children know what we denominate common properties. • That the children practice jumping. Material Resources: Pictures, pieces of chalk to paint the squares of the motion game on the ground. "Good morning my friends. How are you? Do you remember me? I am Solomon the wisest of the wise people, because I know everything and today I am going to teach you something very, but very beautiful. Do you know what common properties are? If you do not know I will teach you because I know it very, but very well." The puppet explains and displays pictures to teach the children what a common property is, which we all enjoy and learn, appreciating its beauty as well as the works of art such as paintings, sculptures, etc. Others like the parks, fountains, cinemas, theatres, where we visit and play in them, we watch films, plays and we also learn. The streets, buildings such as banks, offices, shops or warehouses, in which we take a walk, go shopping and where our parents work. There are museums, monuments, churches, in which we see precious works of art, we learn the history of our country, or we pray. Also the school where we learn is a common property of all the children who attend it. There are other things that are not common properties because they are not for the benefit of everyone but they are personal, such as the clothes that we put on, our shoes, our own school notebooks, our toys, etc. We will play a motion game in which the children will practice jumping and it consists of the traditional game called "Pon". A group of squares are drawn on the floor, the child throws a bottle cap and he must jump to where the bottle cap falls, he will stop where the bottle cap fell, pick it up and he will also pick up a picture that is in that square, which will contain the representation of a place or an object, and the child will have to say if it is a common property or not. If it is a common property he will have to identify it, to describe it and to say how we have to take care of it and to respect it. The cards will be of the common properties already known by the children, so that they can describe them, for example: museum, park, theatre, church, square. There will be cards with other properties, for example: shoes, clothes, ring, fan, wallet. • To jump from a square to the other without stepping on the lines. • To pick up the bottle cap and the picture. • To identify if it is a common property, to describe it and to say how we have to take care of it and respect it. In each square there will be only one card and on the ground there will be painted as many squares as the educator considers convenient but they should not exceed nine and every two squares a double one should be drawn so that the child can put down both feet and rest, for example: The 1st and after the 2nd, then the 3rd and the 4th will be parallel (one beside the other so that the child can put both feet down and rest). The 5th and the 6th, later the 7th and the 8th will be parallel and the 9th square is the finish and one returns jumping in the same way. They recognized what a common property is. They needed help to recognize what a common property is. They identified the place, they described it and they said correctly how we have to take care of it and respect it. They needed help to identify the place, to describe it and to say how we have to take care of it and respect it. They differentiated between common and personal property. "HOW TO TAKE CARE OF MY SCHOOL"
Summary of the activity: Through a conversation we will teach the children how to take care of the things that are common properties in the school because all the children use them. Objectives: To teach the children to take care of and to respect the common properties of their school. Material Resources: The "Little Goblin of the school" Puppet. The educator will explain to the children which are the common properties of the school: the chairs and tables, desks, shelves, toys, game corners, blackboard, outside areas, classrooms, etc. "They are common properties because we all use them and it is necessary to respect them and to take care of them so that they are not broken nor spoiled because later the school will be very ugly. Do you want a pretty school?" • Not to write nor to soil the walls, neither the desks nor the tables and chairs, etc. • To seat properly in the furniture so that it does not break. • Not to spoil the plants in the garden picking their leaves or stems. • To take care of the grass in the outside areas by not stepping on it. • To take care of the toys. • Not to throw papers or other waste to the ground or green areas. • Not to throw papers nor other waste into toilets because they get clogged. From the suggested measures, the educator will explain those that he considers convenient according to the characteristics of his children and their school. Later, he will ask the children about these measures and he will urge them to carry them out. He will tell them that they must remember that in the school there is the "Little Goblin of the school" puppet (he shows the puppet), which sees everything that the children do so that later he tells us. They recognized which are the common properties in the school. They needed help to know which are the common properties in the school. They learned the measures to take care of and to respect the common properties of the school. They needed help to learn the measures explained by the educator to take care of and to respect the common properties of the school. They proposed conducts to be followed to respect the common property of the school. "MY HAPPY AND PRETTY SCHOOL"
Summary of the activity: We will work as a group with the objective of cleaning and embellishing some places of common use in the school. Objectives: To get the children to feel satisfaction when doing a socially useful work for their school. Material Resources: The necessary tools according to the collective work that the educator decides to do with the children. The educator will explain to the children the purpose of the work, its importance, and how they are going to carry it out. Later he distributes the tasks, taking care that they do not exceed the physical possibilities of the children. For example, it can be the cleaning of the outside area or the garden. 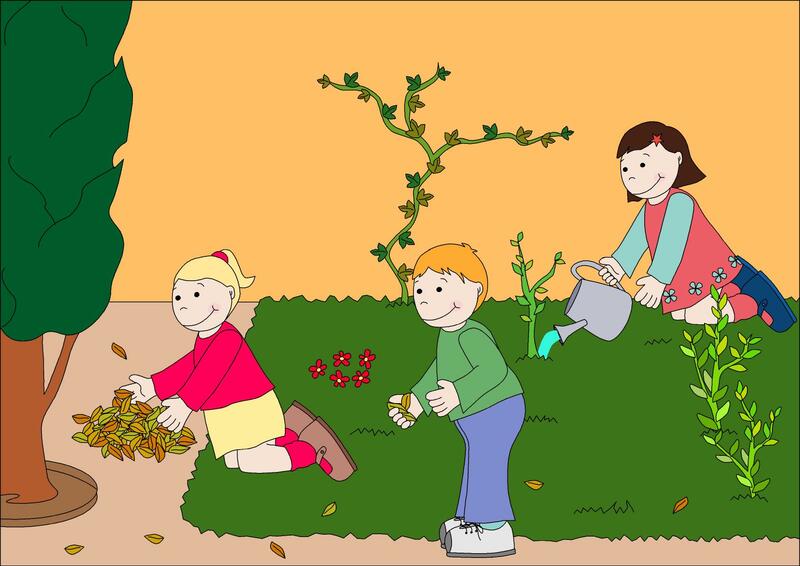 Some children will pick up the dry leaves, others papers, others will take out the weeds, etc. The educator will tell the child the story "The grandfather"; he will make the children repeat it several times until they learn it so that later they say it before beginning the work that they are going to do. there he cultivates rose, the lilies and jasmines. _ We have to keep the ground clean! You help this grandfather in this way! everything is left very clean." The children will do the work; they can sing songs aboit the work that is being done. This part consists of the observation and later the joint evaluation of the work done, emphasizing its importance, its utility, and how this is a way to take care of the school; so that everybody that comes to visit it has a nice time when seeing the school happy and pretty. It is like that, that we have to act to take care of and to respect the school, because in it the children spend a great part of their time every day, in it they learn to be good and cultured. They knew how to carry out the assigned tasks. They needed help to carry out the assigned tasks. They felt satisfaction for the work done. They understood the intention of the collective work. They expressed ideas of how to take care of the common property. "A STROLL TO THE MUSEUM"
Summary of the activity: The activity consists of a stroll to a place in the city to teach the children how to respect and to take care of the common properties. It can consist of a visit to a museum. The educator can select another place, whenever it is appropriate for the fulfilment of the proposed objective. Objectives: That the children visit a common cultural property and learn how to take care of it and respect it. Material Resources: Camera or camcorder. The educator will explain to the children the place they are going to visit and the objective of the visit that will be: to observe a common cultural property of our city, in this case the museum, and how to behave in it to respect it and to take care of it. The necessary arrangements will be made so that a guide accompanies the children and explains to them the visited section, above all he explains to them its maintenance and care. If it is not possible to make the visit with a guide, the educator will explain it to the children. "The museums are kept thanks to restoration work and the care of the art works that are kept in them. There the objects are protected by glass, in the museums the adults cannot smoke, nor enter with objects that can damage the works, nor throw waste on the ground, because these can attract insects that damage the properties that are exhibited there. In addition, these objects cannot be touched in order not to damage them or contaminate them, etc. In this way he will say all the necessary measures to look after the museum. Finally he will explain that these measures are taken because what it is conserved in the museum are very valuable works, famous paintings, beautiful sculptures, etc. that for many years have been and will be visited by millions of people who come from all over the world to admire them. Thanks to the care that were given to these works in the museum, the people, their relatives and friends have been able to visit them, to admire their beauty and to learn the universal culture that there is in them. Did you like the visit to the museum? What have you seen in the museum? Why is it necessary to take care of and to respect the museum? How must we behave in a museum? What would happen if we did not take care of the museums? They understood the value of the museums. They needed help to be able to appreciate the value of the museums. They understood the necessity of the measures to take care of and to respect the museums. They needed help to understand the necessity of the measures to take care of and to respect the museums. They behaved carefully in order not to damage the common property. "I AM THE PARK KEEPER AND I AM THE FOREST RANGER "
Summary of the activity: This is a role play on the topic "The work of the park keepers and the forest rangers". Objectives: To develop in the children experiences on the work developed by some men to take care of and to make them respect some common properties (parks and forests). Material Resources: The tools that the park keepers and forest rangers use. We will hold a conversation to explain to the children and we will show pictures to them so that they have experiences on the work of the forest rangers and the park keepers. We will be explain to them that both take care of the common properties. The park keepers take care of the parks so that they stay pretty, their work consists of making the people take care of and respect the parks. The parks are common properties, for everybody’s use, and the children play in the parks, and also their parents and their grandparents enjoy them, the shade of their trees, their flowers and fountains, this is why we have to take care of them. These workers do not allow us to step on the grass, nor to spoil the flowers, nor to pick up the fruits and branches of the trees; they make sure that we do not throw waste nor litter to the fountains of the parks, their work is to take care of the parks, so that they stay clean and full of flowers. Other workers who also take care of the common properties are the forest rangers. The forests are very pretty places where there are many trees and little animals that have to be taken care of. The forest rangers do not allow us to hurt the animals, nor to hunt them, they take care that nobody smokes in those places nor start fires because the forests can be destroyed. They also take care that the trees are not cut down in order not to damage the environment, because the trees of the forests purify the air and produce rain, so necessary for the life of the plants, animals and the man. There are zones where the visitors can make their bonfires if they go to a picnic in the forest, but only in those zones and always following the rangers’ instructions. The children who want to play the game are invited to take the necessary tools according to the role that they will carry out either the forest ranger or the park keeper. This game must fundamentally be played in the outside area or in the garden of the school. There will be a final conversation to evaluate the game. They got to know the work of the park keepers and the forest rangers to take care of and to preserve the parks and forests. They understood the importance of the work done by these men. They needed help to understand the importance of the work done by these men. They carried out in an appropriate way their respective roles in the game. Summary of the activity: This activity is a critical experience that will serve to evaluate this block. It is a game in which the child will be presented with a card deck with situations, images and/or questions, the teacher explains the cards and the child must answer, if he does it well he will score the points indicated in the card, they are added and in the end the one who scored more points will be the winner. • To verify the knowledge that the children have acquired on common properties. • To verify the development of feelings of care and respect for the common properties. Material Resources: Cards with diverse representations. A deck of cards is presented to the children and they will pick one every time it is their turn; they will answer a total of three times in the game. 1. - They will pick a card in each of their turns. 2. - If they answer in the first turn well, they score 5 points or they get a blue card. 3. - They can get another 5 points or another blue card in the second turn. 4. - They can get 10 points or one red card in the third turn. 6. - The winners will be the children who accumulate more points (15 to 20 points that is: two blue cards and a red one, which are equivalent to 20 points or a red card and a blue one equivalent to 15 points). It is not necessary to tell the children about the sum of the points; we can simply explain how they can win the game through the colour of the cards. When the child picks the card the educator will explain to him what it says, if it is a situation, a question or an image with a question, and the child will have to explain it or to answer it. Each card will have a value that is determined by the complexity of the content that appears in it. The cards with 5 points will have the blue colour and those of 10 points, the red colour. Each child is presented 2 blue cards and a red one. First card. Value 5 points (blue colour). Content: An image of a man entering a forest smoking. Is what this man is doing correct or incorrect? Why? Content: Mention three well-known common properties. Content: It will show the image of a square in the city (or any other common cultural property known by the children). Is this a common cultural property? What must we do to take care of it and to respect it? Content: Image of a child throwing a piece of bread in the park fountain. Is what this child is doing correct or incorrect? Why? Content: It asks: What is a common property? Mention 3 common properties of the school, explaining why they are common properties of the school and how one has to respect them and take care of them. There will be 3 cards per child, six examples of cards have been indicated, the teacher will make up the rest, he can use the questions and explanations on the common properties used in the activities of this block. He will also use what the children have said about the care and respect for the common properties. It will consist of stimulating the winners, allowing them to take the cards with them to their houses to show their parents, and to explain to them why they are common properties. They needed help to know what a common property is. They knew how to explain the measures to care and respect for the common properties. They needed help to explain the measures to care and respect for the common properties. They showed through their answers feelings of respect and care towards the common properties. They gave a correct opinion about the common properties when they analyzed the cards.